Nail art is back and it is back with major style, but only if you have beautiful, strong nails to begin with. Some may be naturally lucky to have the nails to pull off the latest nail trends, but others aren’t so lucky and have nails that peel, crack, or don’t seem to grow. What is a nail art enthusiast to do? Apply a bullet proof coating to your nails, of course! Made of the same material used in bullet proof vests, Nutra Nail® Bullet Proof Nail Care System is a polish that look like a regular clear coat, but adds strength and durability to your nails, protecting them from splitting, peeling, and even breaking. Long-lasting Nutra Nail® won’t peel off and works great as a clear coat on plain nails or as a top coat on that nail art you want to show off, helping your beautiful polish last longer. And the High Gloss Top Coat adds a beautiful sheen to your bare or polished nails. 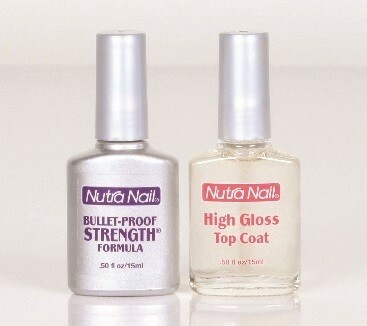 To find out more about the Nutra Nail® Bullet Proof Nail Care System, visit DreamProducts.com.